If you are looking for a beach front property then look no further! This beautiful freshly remodeled 2 bedroom cottage sits directly on the beach - out the back door and into the water. 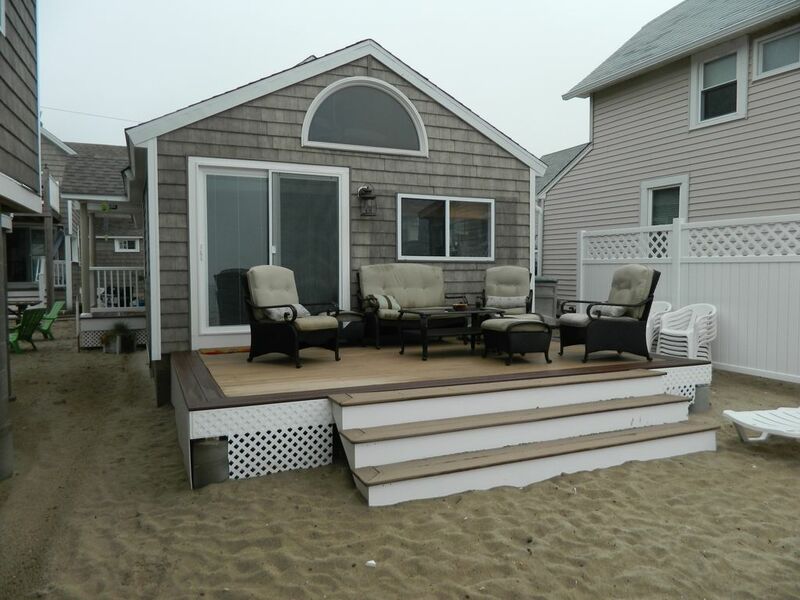 Wonderful rear deck with soft seating overlooks the private sandy beach and Long Island sound. The cottage has been completely re-done inside and out. Everything is new! Free internet Wi Fi, Cable TV, AC. Completely furnished. All you need to bring is linens. Bring your Jet Ski, Boat and use our mornings! We have a wonderful Lake front cottage in East Haddam CT Property #133339 for those who are looking for the calmness of a fresh water lake. Take a look at our other 2 BR beach front cottage in Clinton, CT Property # 200441 next to this cottage. For those who are in need of more space Look at our 3 BR Home in Clinton CT Property # 160220 with private beach access. We had a wonderful stay at this cozy cottage on the beach. The decor was bright and happy, the beds comfortable and the amenities close by. We'd love to stay there again. Thank you! Cottage was lovely, nicely decorated , perfect location right on the beach. Could not ask for a better view in the morning over a cup of coffee. Cottage was very clean convenient location to stores and restaurants. Will definitely be a redo for next year. The cottage is great. Decorated nice and furniture comfortable. Like that everything is included, blender, coffee maker, toaster, dishwasher, cable TV and wifi. Suggest the box spring be replaced in the main bed room. It is so noisy. Viola is a beachfront cottage in a cluster of three cottages renovated with taste by our hosts Sharlene and Karl Kieslich. I made the arrangements by email; the property information was comprehensive and I so appreciated the organization. The decor is bright, beach themed and quite comfortable. We particularly enjoyed the deck on the beach, steps from the water, and back porch for reading, games, snacks, and a glass of wine with the sunset. It was a perfect setting when family from the area joined us for a visit -- my four-year-old niece met new playmates and the nephews went swimming even in May! The cottage is well-equipped with media and the kitchen well stocked with necessities. Parking is a bit tricky, but all worked out. Our "neighbors" were previous renters and so friendly. I grew up in the area and the shoreline has changed these many years. Restaurants and shopping are close as well as some local entertainment. We hope to visit again for a quiet, relaxing break. We had a wonderfull time and will like to come again next year, same time. The sleeper sofa was a little uncomfortable and that room needs shades to block out the morning sun. Also the bathroom needs a shade, the people from the house in front can see in. Thanks again for allowing us to stay there. Next time we know to bring only 1 car. We stayed in the 'Kaitlyn' cottage for one week late in September of 2009. This is an adorable cottage (one of three units) co-located on the Clinton beach. The location was wonderful. Watching the water from the rear deck in the evening is a great memory. The unit was very clean and fairly well maintained. Check-in and out was smooth. Everything in the property description is pretty accurate. The only things I would add relate to the bath and bedroom amenities. The bath for this unit is a pretty rustic add-on to the rear of the cottage. The shower is a small metal enclosure with connected plumbing. The bath is very small and not heated, but I suppose this is to be expected with a cottage. The only place the cottage fell short of our expectations was the main bedroom. Space is limited - again, probably OK for a cottage. However, the quality of the bed was very poor. For the weekly rate charged for this property, a quality mattress and box spring is expected. It appears that these were not replaced with the recent remodel of this cottage. Overall, we had a great experience at the Kaitlyn Cottage. The cottage came with use of the Hobie-Cat sailboat and this was great fun out on the Sound. Clinton is a wonderful Classic New England town. This beach front community has plenty to offer. Enjoy Long Island sound at your back door, or make your way into town for some of the best sea food you will ever have! Movies, outlet shopping, theater, Restaurants, and much much more are just around the corner, or stay at the beach and have fun in the sun. Cash, Check or Credit Card. Credit Card Number Needed for Security Deposit.